Discussion in 'The Grumble' started by framah, Mar 18, 2019. I need enough to make a frame 20 1/4" x 13 3/4". Don Mar has stopped selling any Fotiou mouldings. You might try Jayeness, as they carry Fotiou. This is on my wall, so it's a pretty safe bet. 1-800-509-2324. (Or ask Fotiou for the names of closer regional distributors, or of customers who've last ordered in quantity length). That's still a good number and you should be able to get it directly from Fotiou. You may have to open an account with them. We order from them and they send it right to us. They have 4 locations, 1 in Ontario Canada, 1 in Nashville, 1 in California and 1 in Philadelphia. I order direct from Fotiou. They typically ship within 24 hours. I opened up my account with the when Don Mar stopped carrying them. I have added a number of their frames to my Etsy shop. My fav so far is this one from their Sue Wong collection. Expensive, but I've already sold a few. alacrity8 and neilframer like this. I really like Fotiou - great customer service - quick shipping - very good quality for the money. Would you close you eyes and guess? Yes! That answer is pretty much correct.. The answer is, that pattern can't be matched and it's SO busy that nobody really cares. There are a number of mouldings where you just can't match a pattern in the corners. Especially when we are given exact outside frame sizes, mostly with mirrors, we do the best that we can based on the particular pattern. I usually try to just center the patterns top and bottom and sides, but it varies with each moulding and pattern. Sometimes I will do a little carving and blending in the corners with some mouldings but on that Fotiou, you don't want to be carving or sanding on it. I flail away and cut all 4 legs willy-nilly. I mostly concentrate, like Neil, on centering the patterns. Fotiou has some cool mouldings. I just added about 10 to my Etsy site and will be adding about a dozen more in the near future. It takes quite a while to take the pictures and create the images for the site as well as create and price the listings. 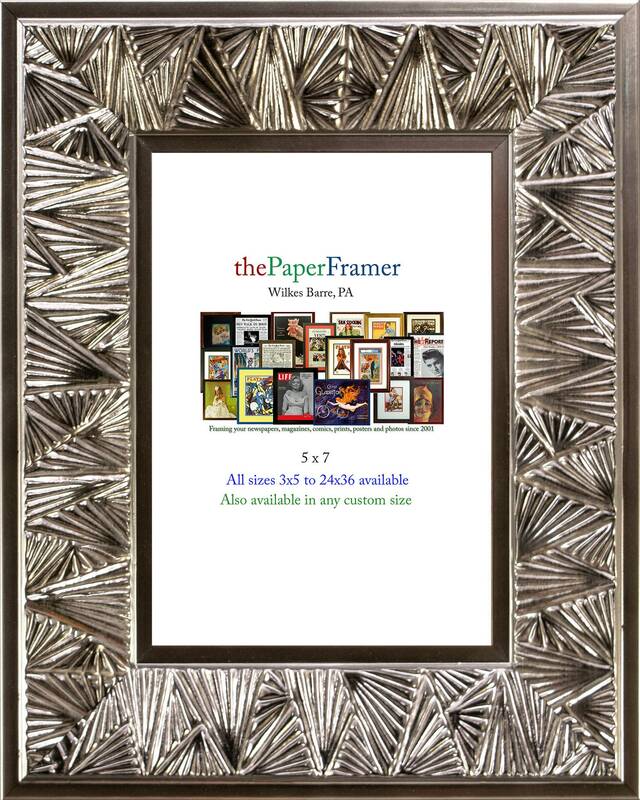 The moulding for that frame is a 2" moulding and is available in Gold/Black and White/Silver. It also comes in 1 1/8" and 3 3/4" widths. I will be adding the 1 1/8" version in the next round of additions. I won't be adding the 3 3/4" version as Etsy's mostly price conscious buyers would choke on their artisan lattes at the price. How wide is the moulding, I have a raw moulding that I can match the finish for you. Thanks for the offer, Max. I called them andthey are sending it out to me. I now have an account with them. Make sure you create an account online. The online pictures of their frame is bad, like most distributors, but they have PDFs of each line that gives you much better images of the frames. The PDFs (they call them Sell Sheets) and visible only from your account dashboard. Here is a sample of one Sell Sheet. They have them for almost all of their lines.